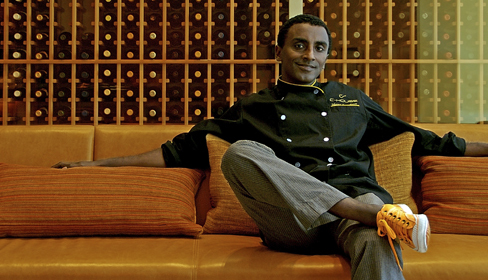 The foodie in me has been as anxious as a kid on Christmas morning every since I saw Chef Marcus Samuelsson looking at spaces in Harlem. Rumor had it that he was opening a new restaurant somewhere in the hood. One day soon thereafter, I saw him looking at the basement of my building. I doubt he would let me come down in my PJs but wouldn’t that have been awesome? My building didn’t win, so I googled. I tweeted. I asked around. I would have tapped him on his shoulder and asked him myself, but he was always in the middle of what looked like an important conversation when I saw him. Maybe that’s just how he speaks. In any event, there is a restaurant. It is named Red Rooster and it will be opening Friday night (12.17.10). Located at 310 Malcolm X Blvd., the space will be womanned by Executive Chef Andrea Bergquist. Below, I have the food and beverage, respectively, menus. Brunch and lunch will be served eventually. To learn more, visit the Red Rooster website. I look forward to some real foodie food up here in Harlem. Finally! Finding anything up here that isn’t the same old same old is a real struggle. That’s why I look forward to Red Rooster. It’s also why I love this new delivery service, Harlem Delivers. They have a bunch of restaurants that give me a bit of choices up here. Go Marcus!